It’s a common problem for readers of the Bible to leisurely skip their way through the first half of Genesis, hopping over a few potholes here and there, keeping a straight path with a faithful eye. Six days of creation and a talking snake doesn’t sound so strange with a few poetic leaps and spiritual metaphors at work. God liked Abel’s animal sacrifice, but turned his holy nose up at Cain’s mustard greens. I’m not too fond of vegetables either. God killed off everyone in the world except Noah and his family, but most folks and those weird giant things all seemed to have it coming, I guess. Sodom and Gomorrah seems, well, a little extreme. But, I’ve been to cities in the past that I wouldn’t mind seeing blasted into a smoldering crater in my rearview mirror. Ishmael gets sent away into the wilderness. The road’s getting a little bumpier, but he at least gets a “great nation” out of the deal (Gen 21:18), albeit probably with a hour-long time-share presentation. Then, Abraham is told to sacrifice Isaac... wait, what? This is understandably where most people get lost in the Bible, patience runs out, the message is lost, and the book gets gently closed (so hopefully God won’t hear it) in favor of forcing the family into another six-hour long marathon of Jesus of Nazareth, just to make sure everyone feels good about themselves by the time Sunday rolls around. If you’re Catholic, this’ll likely end you back up in the confessional in sympathetic company. If you’re Protestant, you might just push on through and keep reading after a few bites of potato salad from the Bible study potluck pushes the issue down just in time for you to choke on how Joseph’s brothers dump him in a hole, but make sure not to let it ruin their otherwise pleasant afternoon. And, if you’re an Anglican, you might just shove the issue aside and be grateful that it’s something for the Catholics and the Protestants to sort out. However, just like Joseph and his amazing, bloodstained color cape, this issue won’t go away and things will just get harder from here on out. So, it’s time to hoist up little Isaac, toss him on the wood pile, and figure this problem out, hoping that at some point God will step in and lend a hand so we don’t slit the poor kid’s throat. Make no mistake, this is the is point of the book where it’s not just Abraham learning to trust God, it’s also us learning to trust him. Shutting the book or pretending the story doesn’t bother us really just means that we’re passively agreeing to the occasional romp in the sack with our wife’s hot, Egyptian slave girl, because things might not work out the way God said they would. It’s tempting, but let me try and put you back on track first. While Genesis is a dense nexus of theological richness, if I had to sum it all up in one word that nailed the whole mess down and made sense of it, it would be this—trust. Adam and Eve decided not to trust God when he said they had everything they needed and not to eat that one fruit, but they took matters into their own hands and trusted the snake instead. Cain was told not to worry about his greens and keep on keeping on, but he didn’t listen and killed his brother out of envy and wrath. Noah, a “righteous man” (Gen 6:9), was told to build an ark, which, despite what children’s books would have us believe about it being a snap to do, was no small undertaking (just ask any boatbuilder about constructing a 450-foot-long boat, without power tools or hardware stores). It was a good thing he did trust God, or he’d have been drowned along with the unicorns and jackelopes. 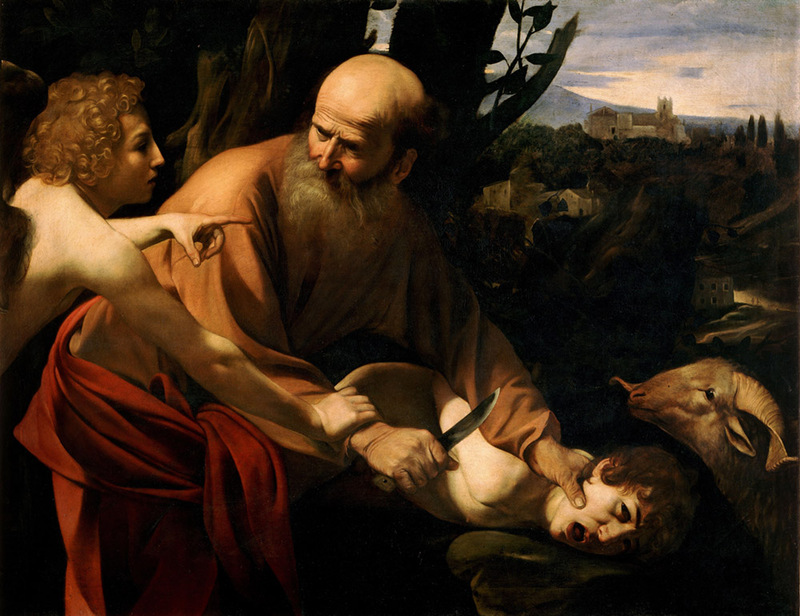 Abraham and Sarah were told they’d get a child, but they got impatient and became a dysfunctional family dynamic that needed Jerry Springer about four thousand years before cable would even be invented. Abraham’s entire life, with all its trials and labors, was one long trust exercise. Just about everything he did was closing his eyes and falling backwards into God’s arms and, apart from the incident with Hagar, he did a pretty good job, especially for an old guy with no retirement plan as a safety net. As such, we get the sense that he was engaged in a life-long vocation, imposed on him by God, the fruits of which were a promised child—not just any child, but the seed of a “multitude of nations” (Gen 17:5). So, what do you do at the ripe old age of a hundred, after running God’s errands for twenty-five years, putting your neck on the line and giving up everything along the way, finally getting your long-sought-after only beloved son, and then being asked by the Big Man to give him back? Well... you kind of have to do it. Why should Abraham have to do it? Why would a loving God even ask for such a thing? Let’s take both of those perfectly valid questions in turn. First of all though, before anyone gets the idea that hearing voices telling you to sacrifice a person means you should do it, I’ll take a pause and address the idea of prophetic certitude. Even a cursory reading of Genesis 12-22 will show you that God was no fool and wouldn’t have opened with such a request. While still bold by our standards, the first thing he asked Abraham was to leave his homeland of Ur (a southern Mesopotamian area rife with paganism) and head out on the open roam, um... “to the land that I [God] will show you” (Gen 12:1). Like I said, a bold request. Good luck getting me to leave my house for “a land that you will show me” when I’m a tired seventy-five years old. Nonetheless, we get our first dose of Abraham’s faithful loyalty—the poor old guy loaded up the truck and moved out without so much as a GPS or a bag of sunflower seeds. God would speak to Abraham to few more times along the way, each time leading him in the right direction and all the while delivering him from various dangers and pitfalls. So, when God finally gets around to the big guns and tells him to offer Isaac up as a burnt offering, Abraham already had him on his caller ID at that point, so to speak. There was a prophetic relationship, the likes of which most of us will never experience, between Abraham and God that was at least twenty-five turbulent years in the making. So, if you hear a voice one day out of thin air (or from your dog, for example) that asks you do to something that sounds totally crazy, well, chances are you’re totally crazy, and you should treat these exceptional stories as just that—the exception, not the rule. This is also glossing over the fact that at this point in the Old Testament, we’re still deep in what I would call theological narrative territory. That is to say that, while the Old Testament will get into a more historically literal rhythm later in the book and I am not suggestion that we take Genesis as just one long fairy tale, it is still a very old story, passed down through verbal tradition before being written by likely several hands over the course of many, many years. So, while the theological messages are still rock solid, we’re not to take each and every narrative detail at face value, lest we end up getting tangled up in how lions lived off carrots (Gen 1:30) and why the penguins and sharks were let off the hook when God was mad at the world (Gen 6:7). The truth is, there’s even still Hebrew words (that original language of the Old Testament) that we don’t for sure know the meaning of. Therefore, knowing that we’re still knee-deep in ancient narrative tradition, we push on and attempt to draw out what God is trying to tell us, rather than what the guy holding the pen a couple of thousand years ago was thinking. Why should Abraham give up his son, his only son, Isaac (Gen 22:2), just because God asked for it, and with seemingly no justification? To answer this, we simply have to look back at the basics of Genesis 1 and 2. God made everything—tomatoes, ducks, clouds, and dirt—and gave it to us, mankind. He spun all this miraculous amount of stuff into being from nothing, handed it to us, and basically said, “Here you go, take good care of this for me” (Gen 1:28-29). Knowing this, we can conclude a simple and quite humbling fact: All of creation belongs to God and he can ask for it whenever he wants to. Maybe when one of us can whip up a whole planet full of koala bears and roly polies and stuff in one supreme act of creative potentiality, then we can get a little cocky and tell God to back off. But, as things stand, that’s not the case. While I admit that, so far, we don’t have much to comfort us in answering the first question, let’s attack the real nagging question of why God would do such a thing if he really is all good. Well, there’s a lot of brilliant speculation on how to untangle this knot, but my suggestion is that he actually wouldn’t, because he didn’t. Since God is timeless and unchanging, we have to remember that he doesn’t make mistakes, change his mind, and sees all of history as a single, perfected moment. This is kind of like how we think of a book we’ve read, and the characters in chapter one never know what happens in chapter two until they’re in chapter two, but we always know what happens in chapters one and two all the time. If that blows your mind a little bit, it should. Let’s just get back to the basics though. If all of Abraham’s life was one long test, why would this moment be any different? This whole story is one of Abraham’s formation as the father of God’s people, the Israelites, and later, Christians: “I will establish my covenant between me and you, and your offspring after you throughout their generations” (Gen 17:7). This is where “typology” comes into play. If Abraham is to be the start of God’s “people project,” so to speak, then he’s sort of a foundation, a rock, perhaps, on which God will build his nation. If that sounds familiar, flip several hundred pages forward in your Bible to the New Testament, Matthew 16:18, and you’ll see why. This test, the final and greatest test, is one which says, “You’ve done all this for me, I’ve never abandoned you and you’ve always had faith. Now show me how much you trust me.” So, Abraham, with full faith and attentiveness, when called on by his God, said, “Here I am.” He answered God’s call without hesitation and did his will without question. “He did not withhold his own Son, but gave him up.” If that bit sounds familiar as well, then turn over again to the New Testament to Romans 8:32 and see who else wasn’t willing to hold back giving up his Son. Did Abraham lament what he had to do? I’m sure he did, but he lived by his trust in God, even to the very moment, before which he had said, “God himself will provide” (Gen 22:8). And, it was at the very moment that we see not only God’s goodness come through, but also the ultimate pinnacle of Abraham’s trust. When God asked for Isaac to be sacrificed, Abraham replied, “Here I am.” When God called out to him to stay his hand, Abraham replied, “Here I am.” At every step of the way, he was open, faithful, and attentive, to the very last moment. As a side note, I've always thought Caravaggio's painting captured this moment fairly well, particularly because of the subtlety of Abraham's expression that bears the marks of single-minded, yet deeply sad resolution, followed by confusion at the moment of intervention. Even with all that behind Abraham, and God's blessing on them both, can you even imagine how the walk home must've been for those two? You probably could cut the tension with a sacrificial knife, not to mention the fact that Isaac probably slept with one eye open for quite a while after that little incident.